Wayland Baptist University invites you to a 30th anniversary celebration and open house picnic, 11 a.m.-4 p.m. Friday, October 2. Free food, facility tours, and a raffle! Raffle proceeds benefit the Food Bank of Alaska. Canned goods also accepted. Parkside Campus: 7801 East 32nd Avenue. Access via Old Muldoon Road off 36th Avenue, west of Muldoon Road. (907) 333-2277. Scenic Foothills Community Council meeting, 7 p.m. Thursday, October 1, in the auditorium at Wayland Baptist University, 7801 East 32nd Avenue. Access via Old Muldoon Road off 36th Avenue, west of Muldoon Road. Everyone is welcome. See newsletter, agenda and minutes links above this post. Click here for map and driving directions. 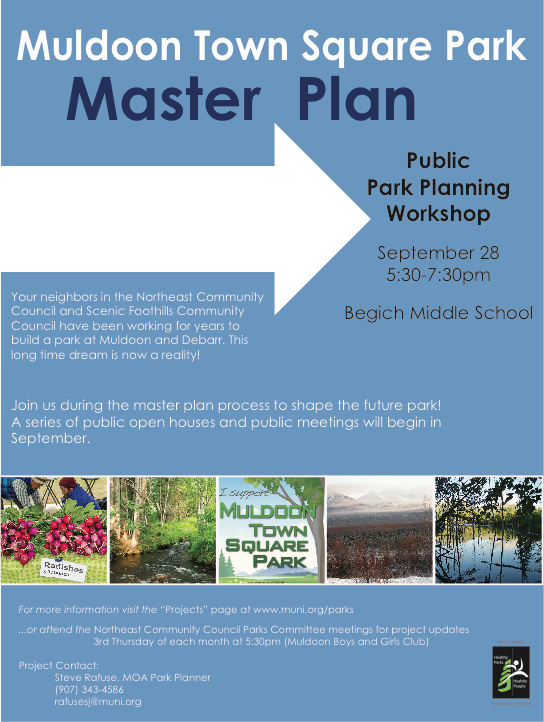 Muldoon Town Square Park Master Plan Workshop September 28, 5:30 pm – 7:30 pm Monday, September 28, at Begich Middle School, 7440 Creekside Center Drive. Please come and add your input on planning this new community park on the old Alaska Greenhouse site at DeBarr & Muldoon. Proposed site of Muldoon Farmers Market 2017. Celebrate Autumn at the LAST MARKET of our 2015 season!